Uzbekistan and France signed a memorandum on the creation of two modern laboratories that meet the requirements of international accreditation, Trend reports citing the press service of Uzbek Academy of Sciences. The labs will be able to identify products containing GMO (Genetically modified organisms), as well as to find stable (toxic) organic compounds and to research them, the press service states. 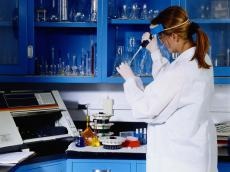 The creation of these two laboratories at the Institute of Genetics and Plant Experimental Biology of Uzbek Academy of Sciences will provide an opportunity to conduct research on modern topics of GMOs and stable organic compounds, and at the same time it will open new trading opportunities which in turn will have a beneficial effect on country’s economy. Three interstate standards for the determination of genetically modified organisms (GMOs) entered into force in Uzbekistan in September 1, 2016. The introduced standards are identical to international ISO standards and contain analysis methods for the detection of genetically modified organisms and derived products. Prior to this, there was no single regulation for certification of products using GMOs in Uzbekistan.